I’ve been working as a Resolve colorist for the past couple of years but last summer I was asked to sub for a veteran SpeedGrade colorist on a drama to be broadcasted on Radio-Canada. I did the first two shows on Resolve and finished the remaining shows on SpeedGrade. I was amazed at the speed and responsiveness of the Adobe app. I then began to jump from one system to the other depending on the project and the DP. I find Resolve to be a much more effective tool for creative work with a DP who wants to try very precise variations at the beginning of a project. On the other hand, SpeedGrade is much faster to help you grade through long episodes, apply vignetttes and do modifications on whole scenes during approbation sessions. As I was changing software so often, I needed to find a way to move grades, tools and looks across platforms and I found out I’m not the only one doing this. This is why I’m writing these articles on looks exchange between apps. The first one is about building a grade in Resolve and moving it to SpeedGrade to use it in another project. 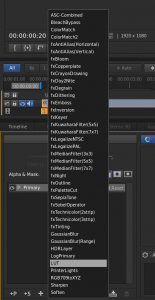 So, let’s see how to build a complex look in Resolve and export it for SpeedGrade. 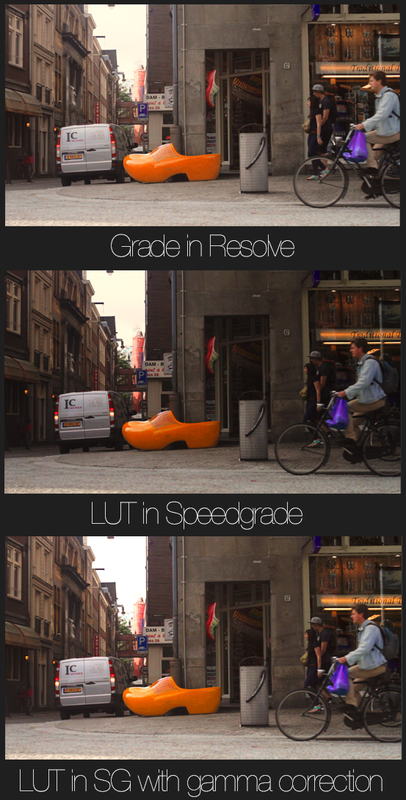 To do this, we will use the deep Lookup table (LUT) integration in SpeedGrade. 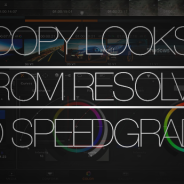 SpeedGrade can import, use and even convert various kinds of LUT. Lookup Tables can recreate about any color modification applied to a digital image: saturation, luma, hue. It acts as a reference table between two color setups. It takes the RGB value of the source and gives it the equivalent values in the referenced setup, doing so, it changes the color and applies the look. LUTs are very powerful. The only grading tool it cannot support is the power window. LUT can make no reference to a position, it’s only applying a color modification to predetermined color. Therefore LUTs cannot be used for vignettes, masks or grads. Once I’m done building the grade in Resolve, I will need to create a LUT of this grade to be able to pass it on the the SpeedGrade workstation. To do so I will right-click the thumbnail of the shot in the Thumbnail timeline of the Color page and choose Generate 3D LUT. A pop-up menu will then appear to let you select the right folder to save your LUT. I suggest that you create a new folder with your project name. You can also name your LUT accordingly with the episode, scene and shot number. 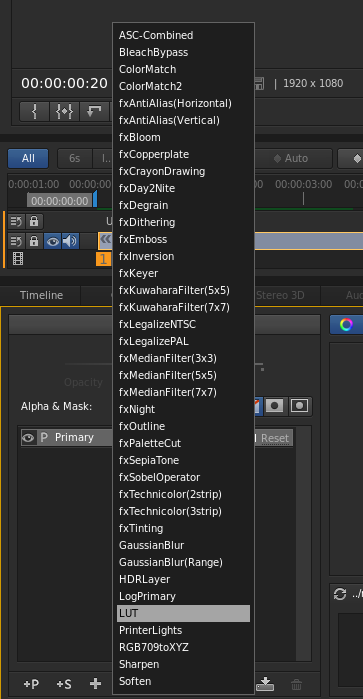 Contextual menu revealing the “Generate 3D LUT” option. To make sure that the LUT you just created truly reflects the grade you worked on, create a new version of the grade, reset memory and apply the LUT to the shot. It should look exactly like the grade you built with the nodes. There are a couple of thing that will not translate from a grade to a node. Vignettes, blurs and shrink used to tighten the selection of the qualifier. No modification that relates to space, movement and position will be kept in the LUT. If you use PowerWindows, you will have to export a different LUT for every NODE using one. However, curves, Qualifiers, Primaries, Hue and saturation modifications will pass just fine. We can now copy this LUT to a disk or send it by email to the SpeedGrade station. 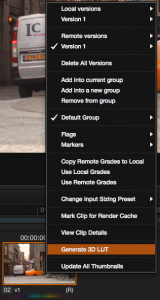 On your SpeedGrade workstation, you can copy the LUT in you project folder. Unlike Resolve, you can put the LUT anywhere you want and you’ll be able to browse to it from the LUT look layer. 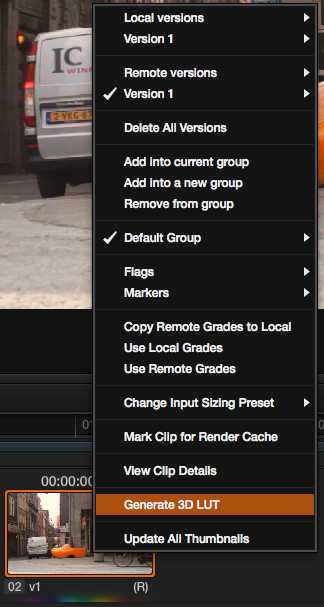 So, once you’ve opened your new SpeedGrade project, jog to the desired shot, and go to your stack to open the “+” menu. In the pop-up menu, select the LUT look layer. Then, if you select it in your stack, you’ll be able to go to the tool window and choose the LUT you created in Resolve for this shot. If you didn’t place it in the SG LUT folder you can browse your Mac and point to it by clicking the “…” button next the the drop down menu. If your look doesn’t look exactly the same in SpeedGrade, it’s maby because you have a gamma shift or interpretation difference on your footage. You can leave a leave a Primary look layer in your stack and adjust the gamma to match the desired effect. If you exported different LUTs for the nodes using Power Windows, you’ll have to use a LUT layer for each and apply a Mask manually to each one of them. Luckyly, in SpeedGrade CC, you can now use multiple Masks per layer. So, now you’ve moved a grade from Resolve to Speedgrade using the powerful LUT integration tools of the Lumetri engine. If you save your .Look, you can event use the LUT in Premiere now. I’m already working on the followup article where I explain how to move SpeedGrade CC .Looks to Resolve so be sure to be back soon. Mathieu this is really helpful. Looking forward to the next one! just spectacular and that i could think you are knowledgeable on this subject.